Keep what you do online or on your computer to yourself and protect your privacy! Securely erase tracks and secrets. Completely destroy information stored without your knowledge or approval. Clean all your favorite browsers. Clean all your favorite programs. Completely destroy information stored without your knowledge or approval: Internet history, Web pages and pictures from sites visited on the Internet, unwanted cookies, chatroom conversations, deleted e-mail messages and files, temporary files, the Windows swap file, the Recycle Bin, etc. 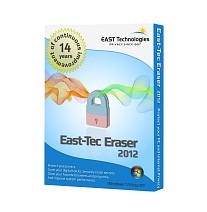 East-Tec Eraser 2012 cleans Internet Explorer, Mozilla Firefox, Google Chrome, Opera, Safari, etc. and securely deletes all your Internet history, visited web pages and images (Temporary Internet Files or cache), address bar locations, unwanted cookies, and much more….